Balneotherapy has been shown to reduce systemic blood pressure in healthy volunteers. Hyperthermia might ameliorate the inflammatory status in heart failure through improving cardiac function. The purpose of this study was to examine the beneficial effects of balneotherapy in patients with chronic heart failure (CHF). Thirty-two patients with systolic CHF classified as New York Heart Association functional status II or III were randomized to divide either a balneotherapy group or a control group. The patients in the balneotherapy group were immersed in a hot spring at 40°C for 10 min daily for 2 weeks; the control group patients took a shower daily. 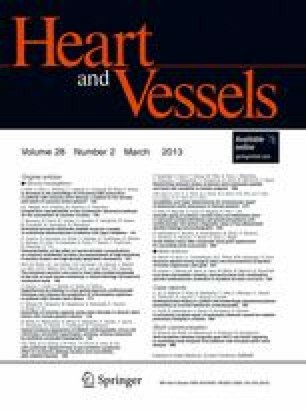 The left ventricular ejection fraction (EF) and cardiothoracic ratio (CTR) were evaluated and plasma brain natriuretic peptide (BNP), high-sensitivity C-reactive protein (hsCRP), tumor necrosis factor (TNF)-α, interleukin (IL)-1β, and IL-6 levels were measured. The clinical symptoms improved after 2 weeks of hot spring therapy. Although the heart rate did not change, clinical symptoms, CTR, EF, and BNP were significantly improved. Moreover, the inflammatory responses, including hsCRP, TNF-α and IL-6 decreased significantly after balneotherapy. The improvement of BNP correlates with the changes in inflammatory biomarkers. Repeated hyperthermia by bathing in a hot spring is therefore considered to improve the cardiac and inflammatory status in patients with CHF.